The World Poker Tour™: a television phenomenon that has captured the world’s attention and imagination. Now, for the first time, get all you need to play like the pros in a tournament setting in your own home! Includes 300 11.5g clay-filled tournament poker chips, two decks of casino-quality cards, and aluminum case. These quality poker chips come in three colors: 150 blue, 100 red and 50 black. Clay filled, these chips have the look, feel and sound of an authentic casino poker chip. 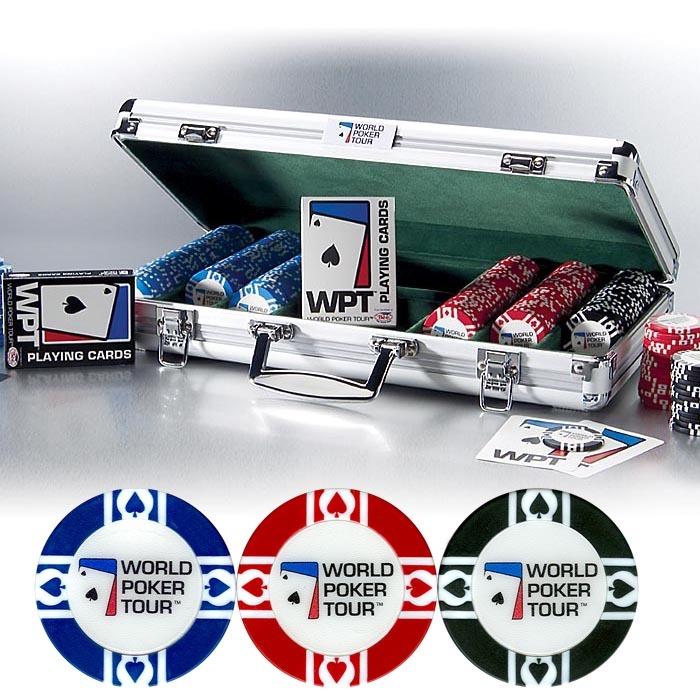 Each chip has the World Poker Tour logo laminated on each surface to ensure durability. A four spade design decorates the outer edge of each chip. Each edge of the chip features a unique stripe and dot motif. These are classy chips! The set also comes with two decks of Official World Poker Tour Playing Cards. The hottest televised poker tournament meets the highest quality playing cards to bring you the true feel and playability of the top casino card! Perfect for Texas Hold'em or any card game, this deck is highly durable - with the best shuffle and snap. Retains shape and feel after hours and hours of play. And holding this set together is a durable aluminum case to protect this valuable and limited poker tournament set. Lined with plush green felt and lightweight, this is a case that will last a lifetime. This sturdy case also features a reinforced handle. Comes in its own colorful retail box. This is an officially licensed product and we are an authorized dealer for The World Poker Tour.